It’s not often that I do a video presentation :). 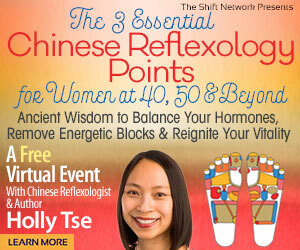 So I’m super excited to invite you to a FREE online event on The 3 Essential Chinese Reflexology Points for Women at 40, 50, and Beyond. Please note the event has passed, but there’s a FREE recording available now. Simply sign up with the link below to get access to the recording. During my online presentation, I’ll walk you through you easy hands-on exercises to harmonize your qi, and help you take charge of your health so that you feel better, sleep better, and yes, even look better! I’m partnering with The Shift Network, to bring you this presentation, as it helps me share the amazing healing powers of Chinese Reflexology with even more people. They’re good folks at Shift, heart-centered with a mission to create a sustainable, peaceful, healthy and prosperous world. They believe in a world in which we know we are one sacred family and are united in our divinity, while celebrating our diversity. Because I’m presenting in partnership with Shift, they’ll be handling the sign-up and registration process for this FREE online event. Admittedly, it feels a bit weird for me to give the reins to someone else to handle the logistics. But it frees me up to focus on creating content. If you’re a longtime reader of my blog, you know that I DO NOT DO FLUFF presentations. I try to pack as much useful information into the allotted time. When I run my own events, I tend to go over by an hour or two because I’m so passionate about sharing Chinese Reflexology. I know it makes a difference in people’s lives.